Hi Vern, "Thanks for recommending your Biotin 800 pellets with 50mg of Biotin. I just re-ordered another 20lb bucket. I can see a big improvement in my horses' hooves after feeding it for the last 30 days.'' J. Madison, St.Paul, MN. Also comes in 6lb and 35lb sizes, both offered on this site, includes free shipping, ordering the 35lb size reduces your feeding cost per day to 38 cents. Biotin 800 Pellets (Kaeco) contain high potency palatable Biotin (800mg/lb) and Yucca Schidigera (500mg/oz). Each 1 ounce Pelleted feeding scoop contains 50mg Biotin, 460mg Calcium Pantothenate, 500mg Yucca and 25 mg dl-Methionine in a very palatable Pellet. 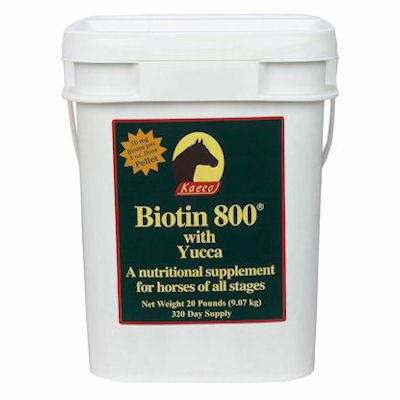 Horses Love to Eat Biotin 800 Pellets And at only 48 cents per day. Biotin 800 provides 50 mg. of Biotin per 1 ounce feeding. It is the highest potency Biotin hoof supplement on the market at a cost of only 48 cents per day. For Adult Horses feed 1 ounce daily.